On Memorial Day weekend in 2016, a triathlete set out on a mile-and-a-half swim that would take her from the entrance of Newport Harbor along a buoy line, an area often used by bathers. But before she could finish, she was attacked by a great white shark; the bite wounds, stretching from her shoulder to her pelvis, indicated that it was a ten-footer, at least. This past March, a kayaker paddling near Monterey’s Cannery Row was watching dozens of dolphins and seals swim by when his boat was rammed from below so hard that the impact sent him flying. Splashing down a few feet away, he looked over to see his kayak between the jaws of a great white. Two months later, the beaches of San Clemente were shut down after more than two dozen white sharks were spotted nearby. Naturally, the news coverage of all these events was intense, and more than a few beach-going Angelenos worried that great whites would be invading the waters off L.A., too. But the truth is that the most fearsome of sharks has long frequented L.A. County’s 75 miles of coastline. In fact, Santa Monica Bay is a hot spot for the species, also known as Carcharodon carcharias. 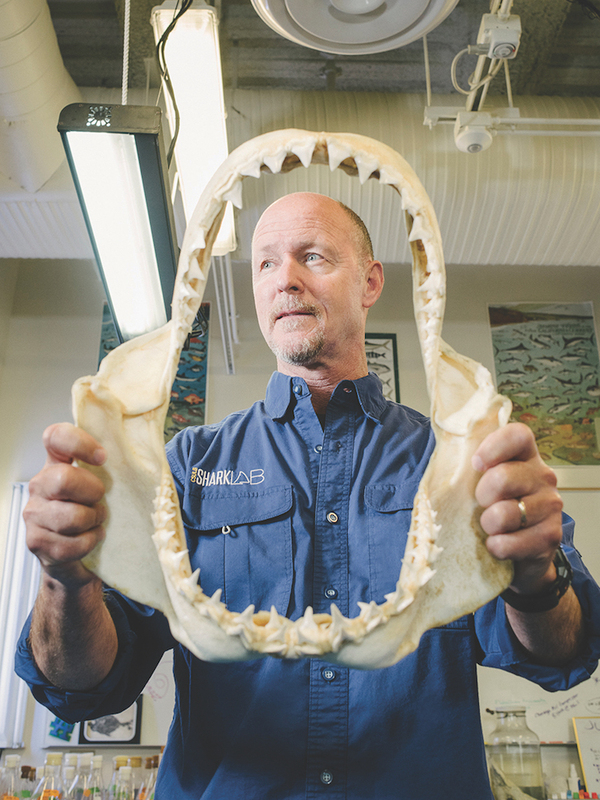 “Most people do not realize that our front yard—L.A.’s front yard—is home to one of the largest nurseries for white sharks in the world,” says Chris Lowe, professor of marine biology at Cal State Long Beach. Note that he says “nurseries”: The great whites that frequent the shallow bays of Central and Southern California tend to be youngsters, measuring five feet long at birth. They typically show up along our beaches from about May through October. At least, that’s what’s supposed to happen. Over the past few years, the sharks have stayed through the winter into the following spring and summer—a change of behavior that helps explain the spate of recent sightings and encounters. 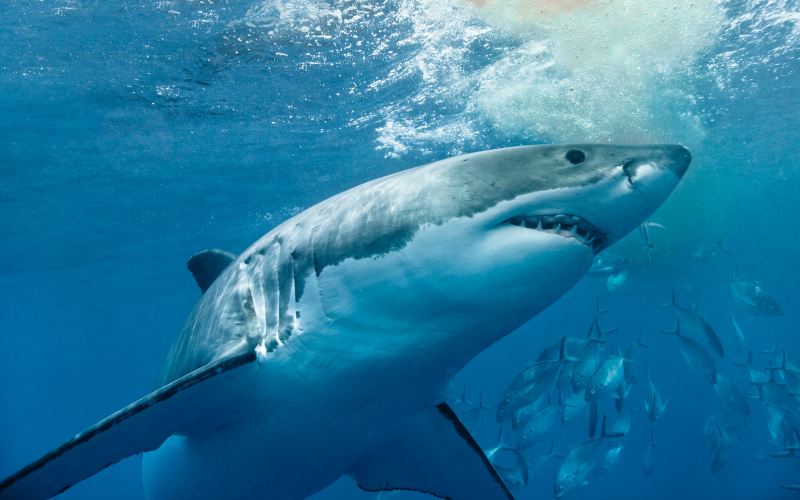 More than a dozen shark species are commonly found swimming L.A.’s coastal waters, from the familiar leopard shark and pelagic thresher shark to the lesser known broad nose seven gill and the soup-fin, but none inspires as much fear and awe as the great white. Lowe has been studying these sharks for more than a decade, tagging them with small radio transmitters. When a shark passes near one of the 200 acoustic receivers he and his colleagues have set up in the area (25 in Santa Monica Bay alone), the information is stored on a submerged hard drive. Lowe downloads the data and plots it on a map. One of his early discoveries was that in a typical summer, it’s common to have up to 30 baby white sharks calling some of California’s most popular beaches home. Once a great white is born, it’s on its own, and the shallow waters provide protection from other predators, like bigger sharks and killer whales. They have plenty of easy-to-catch stingrays as well, providing important nutrition. But there’s a bigger reason baby great whites like our beaches: Sharks are warmblooded, the same as humans; however, the smaller sharks can’t regulate their body temperature as well as the 20-foot-longadults can. So after they’re born, presumably in colder, deeper waters, they head toward the shore. As autumn becomes winter, the eastern Pacific begins to cool, dropping below 60 degrees. By November or December, most young sharks usually migrate south to Baja, where it’s still warm. Some return to American waters the next spring, ping-ponging between California and Mexico for about ten years until they are adults and ready to hunt elsewhere for more challenging prey: seals and sea lions. “Up until 2013, I thought I had this figured out. The pattern was really clear,” says Lowe from behind a desk in his Long Beach-based Shark Lab. Then, in 2014, he noticed that the sharks were sticking around. It turns out a severe El Niño that year meant coastal waters remained warm, giving the baby sharks little reason to leave come winter. So by the next summer, two groups of sharks shared the same stretch of coast: the great whites that hadn’t left and the newborns that arrived in spring. When both groups remained after the next winter proved mild, too, three sets of sharks were crowding the same spots: the newborns, the one-year-olds, and the two-year-olds. “We have records going to the late 1800s of fishermen occasionally catching white sharks off the beaches, but imagine seeing 14 in an area the size of a football field,” says Lowe. “This was new.” Like wildfire season, great white shark season suddenly seemed to last 12 months. By late fall of this year, conditions in coastal waters began to suggest a return to normal. Lowe and other researchers are now watching intently to see whether the oceans cool like they used to and whether the sharks will follow the warm water south as they once predictably did. Warmer waters washed a new plankton community into Southern California as well, and some of the microscopic critters sparked toxic algae blooms in 2016. In addition to coloring the water and making it smell like rotten eggs, a few kinds of algae release neurological toxins. Small animals gobble up the toxic algae, bigger creatures snack on smaller ones, and so on. As each animal eats the other, the toxins accumulate. Affected sea lions washed up dead, pelicans suffered seizures, and sales of certain crabs were halted so that humans wouldn’t be poisoned as well. But the young great whites seemed to thrive. To gain a bird’s-eye view of the current situation, Lowe turned to fishing records. Fishermen tend to be extremely detailed record keepers, and their historical accounts of contacts with white sharks offer a way to estimate historical populations. 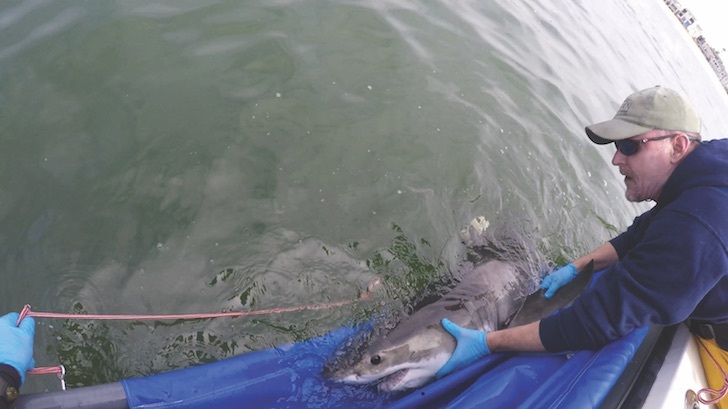 “We combed through records dating back to the ’30s and found 369 records of white sharks interacting with any fishery in Southern California,” says Lowe, adding that 80 percent of shark records concerned baby white sharks. Of those encounters, 85 percent were from gill net fisheries. Made of plastic, gill nets became ubiquitous in the 1970s. They hang vertically from the water’s surface, and when a fish tries to wriggle free from the net’s mesh, the filaments tighten, making escape less and less likely. By the early 1980s, more than 1,000 gill net permits had been issued by the State of California, and by the mid-’80s, the target catch of fishermen using gill nets—white sea bass, halibut, and angel sharks—began to decline from overfishing. Other populations were affected as well. Gruesome photos of sea lions and dolphins drowned in gill nets would provoke California voters to prohibit their use in state waters, which stretch three miles from the shore. The ban was implemented in 1994. The great whites caught in gill nets would often be carved into fillets and sold as mako or thresher shark meat, both of which were common in supermarkets through the 1990s. Because great whites hadn’t been studied intensively until recently, nobody knows for certain how many there were before gill nets, but what is certain is that they were being devastated: The sharks can live into their seventies; being long-lived creatures, they reproduce slowly and not for their first decade, which means they don’t replenish their numbers quickly. So in 1994, the same year that California banned gill nets, the state enacted additional legislation to protect great whites, mandating that fishermen release any great white they caught, by any method, in local waters. Beyond California’s three-mile boundary in the Pacific, gill nets remain legal and the great white protections don’t apply. However, that gave Lowe an idea: He offered to pay a reward if a fisherman inadvertently caught a great white offshore and could get it to him alive. After attaching a transmitter and taking a biological sample, Lowe would return the shark to the sea. Ninety-four percent of the 120-plus juvenile sharks he’s tagged since 2006 survived their release. It doesn’t hurt that the waters they’re swimming in are generally healthier than in decades past. Years of marine mammal protections have allowed California sea lions, a key source of food for adult great whites, to recover from a close call with extinction. Today there are perhaps more than 400,000 of them; less than a century ago there were only 2,000. Scientists also think cleaner oceans helped the great white population. Before the Clean Water Act was passed in 1971, raw sewage and chemicals like DDT were pumped directly into the ocean, including Santa Monica Bay. All of these changes have given the great white population a boost, though it’s anybody’s guess what the long-term trend for the local population will be. Oceanographers report that climate change is causing El Niño events to become both more intense and more frequent. As Ford says, it could be that in 10 or 50 or 100 years, we’ll look back on 2015 as the year when things really started to change. While that doesn’t mean you should stay out of the water, Lowe does suggest opting for more crowded beaches. Not only are sharks statistically more likely to bite people who are alone, Lowe suspects that great whites actively avoid crowded areas. “Humans are loud and noisy and smelly,” he says, “and we chase away their favorite prey.” But he’s not even all that worried about lone surfers. “People can keep doing what they’re doing, and the probability of being bitten is really, really, really low,” Lowe says. As shark populations grow and alter their annual migrations, those odds may increase slightly—but a slight increase over extremely low odds is still extremely low odds. Next articleStar YouTube Chef Byron Talbott on Where to Eat (and What to Avoid) in L.A.